Registrants of pluripotent cell lines which have been successfully validated and accepted in hPSCreg are now offered the possibility to publish the generation and characterisation of their cell line as a Lab Resource article. Lab Resource articles will undergo fast-track editorial review at Stem Cell Research and upon acceptance they will be published online with their own citable DOI. Furthermore, hPSCreg records and Lab Resource articles will be cross-linked so that both resources will be readily available from both platforms. Publish registered cell lines in Stem Cell Research will provide registrants with immediate visibility and dissemination within the community for their newly generated cell lines. 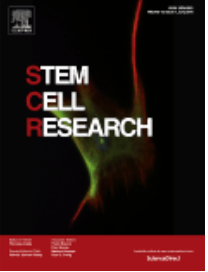 Lab Resource articles in Stem Cell Research are Gold Open Access publications. If you have already registered and submitted a line in hPSCreg and you are interested in publishing it as a Lab Resource article, you can press the Elsevier submission button to get a Lab Resource pre-filled submission template or visit the Lab Resource Submit website http://www.journals.elsevier.com/stem-cell-research/lab-resources/labresource-submit/ for a blank template (please mention that the line has been registered in hPSCreg).